APY vs. APR: besides the one letter, what’s the real difference between these two acronyms? Chances are, both of these terms impact you every day. However, many Americans remain clueless when it comes to these basic financial terms. Fortunately, the concepts of APR and APY aren’t difficult to understand. When you’re dealing with a financial company, whether it’s opening a bank account or taking out a loan, you’re likely to discuss interest rates at one point or another. Companies often advertise the high rates that they pay on savings accounts or great low rates that they charge on loans. If you look carefully, you might notice that financial companies advertise these interest rates as either an Annual Percentage Rate (APR) or an Annual Percentage Yield (APY). They sound very similar, but the difference between them can be significant. To understand the difference between an APR vs. APY, let’s break down how each one works. APR Definition: APR (Annual Percentage Rate) is the annual rate of interest that you will earn on your savings or be charged on your debt. Periodic Rate X Number of Periods Per Year = APR. APR is good if you want to determine exactly how much you’ll earn in interest this month. Divide the account’s APR by the number of times it compounds each year (monthly, quarterly, daily, etc. ), then multiply that amount by your current balance. This number is how much you’ll earn or pay in interest this month. However, it won’t give you an accurate measure of how much you’ll earn over the course of a whole year. APY Definition: APY (Annual Percentage Yield) is the annual rate of interest that you will earn on your savings or that will be charged on your debt. Where it differs from APY is that it does take compounding interest into account. You can calculate APY using the following formula. If you earn .1% interest in your savings account each month, the APR would be 1.2% (.001 X 12). The APY of the account is (1 + .001)12 – 1 = 1.2066%. 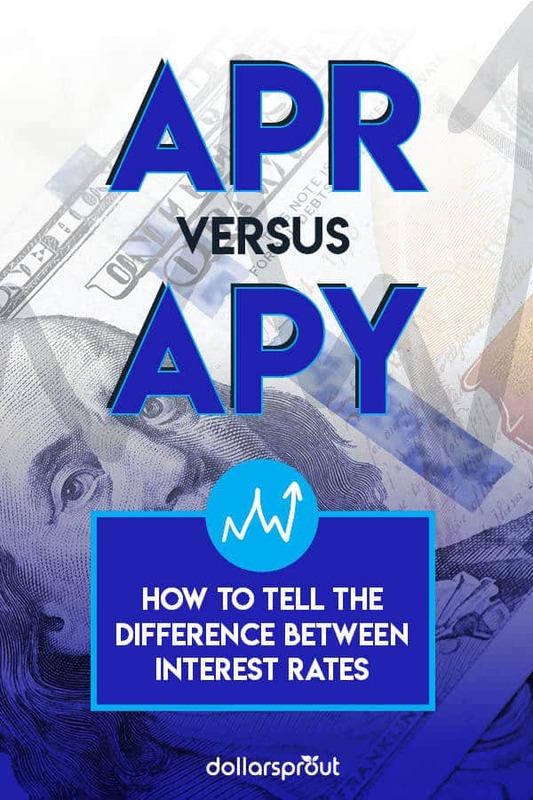 Even with the same periodic rate, the APY is higher than the APR. If you compound the interest daily, the APY will be even higher at (1 + .001)365 – 1 = 1.2072%. The more often you compound interest, the higher the APY will be, even if the periodic rate stays the same. APY is the best rate to use when you’re trying to determine exactly how much interest you’ll earn or pay over the course of a year. Simply multiply your initial deposit by the APY to determine your interest. In the end, the difference between APR and APY comes down almost entirely to the concept of compounding. 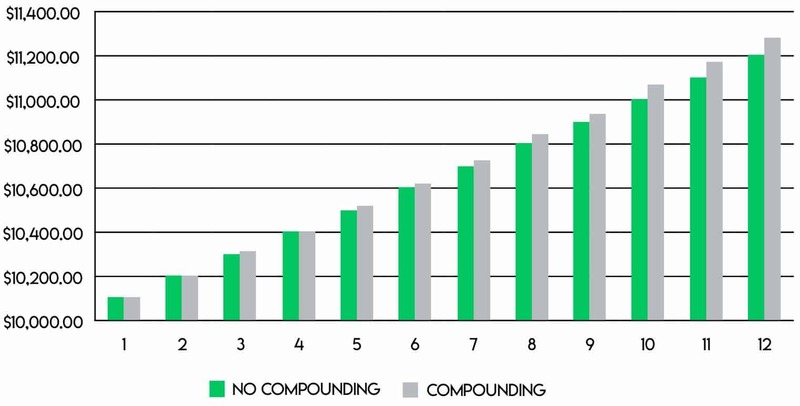 Compounding is the idea that the interest that you earn will go on to earn interest of its own. This will either accelerate the growth of your savings or cause you to pay more in interest over the course of your loan. The more often that your interest compounds, the higher the APY will be when compared to the APR. For example, if the APR of an account is 1% and the account compounds monthly, the APY is 1.00459%. If the account compounds daily, the APY is 1.005%. This is good if you’re a saver because it means that you’ll earn more interest over time, even without making additional deposits. However, this is bad news when you borrow money in the form of a loan or credit card. That’s because the interest you’re charged will incur additional interest charges, slowing your progress toward paying off your debt. When you’re shopping for a loan or credit card or want to get the best interest rate available on a savings account, look at whether the bank is advertising APR or APY. The APY will give you a clearer indication of the cost of the loan or the interest that will be paid on the account. The best way to compare two financial options is to look at the APYs of both. If all you have is APRs, you’ll need to know how often each account compounds, and if the compounding schedule is different, you’ll have to calculate the APYs to get a true comparison. Let’s look at an example to see how compounding works and the difference between APY vs. APR. Say you open a savings account that pays a massive 12% APR. You’ll earn 1% interest each month. You deposit $10,000 to start with and will take your money out of the account after one year. After the first month, you earn $100 in interest, bringing your balance to $10,100. After the second month, you earn $100 in interest on your initial deposit, plus an extra dollar in interest on the $100 you earned in the first month. In other words, your interest earns interest. That means that you’ll get $101 deposited to your account after the second month, leaving your balance at $10,201. In the third month, you’ll earn the same $100 in interest on your initial deposit, plus $2.01 on the $201 in interest you’ve earned. Each month, you earn more interest because the interest you’ve already earned earns interest of its own. By the end of the twelve months, you’ll have $11,268.25. If interest didn’t compound and you simply received the APR advertised on the account, you’d receive $100 each month in interest payments. By the end of the twelve months, you’ll have $11,200 in your account, $268.25 less than the account that compounded interest. With two concepts that are so similar, it’s not surprising that banks and other financial companies will pick and choose which they use when they advertise their services and try to draw in customers. Typically, when people are shopping around for a loan, one of the first things that they look at is the interest rate. The APR of a loan is always lower than the APY because it doesn’t take into account the potential compounding of interest on the loan. For that reason, lenders almost always quote the APR of a loan or credit card when advertising it. At the rates charged by some loans and cards, the difference between APR vs. APY can be huge. For example, a credit card with a 19.99% APR that compounds monthly will have an APY of 21.927%, almost a full 2% higher. On the other hand, banks and investment providers will almost always advertise the APY offered by their accounts as it will be higher than the APR. If you see a savings account advertising 1% interest, the number is most likely to be an APY rather than an APR. 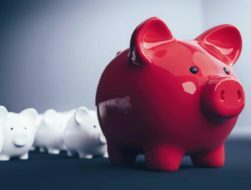 The good news is that APYs tend to be a better representation of the growth of your savings, so if you deposit $100, you’ll know that you’ll receive $1 in interest over the course of a year. Still, understanding exactly what banks and lenders are advertising and why they choose to advertise that way is an important step toward a better understanding of the financial products you’re using. APR and APY are two very similar concepts that differ in how exactly they show the interest that you’ll earn or be charged. Be aware of how banks use APR and APY to advertise and how they’ll impact the true cost of a loan or the true potential earnings of your money. When comparing interest rates, be sure you’re measuring the same metrics: APY vs. APY or APR vs. APR. Measuring APY vs. APR will not provide an accurate comparison. What is a Money Market Account, and When Should You Use One?